Fin Tube Products, Inc. offers a root soldered fin to tube attachment. This method of soldering, available on our larger diameter tubing provides a void free fin to tube joint. This method of attachment decreases the amount of solder used compared to a dip process. This increases the heat transfer of the finned tube. When dipped in solder a full coat/film of insulating solder is formed over the entire fin and tube surface. 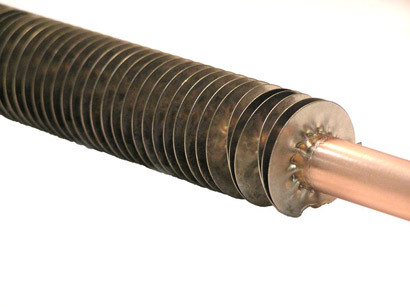 Soldered fin tubing is good in temperatures up to 375°F. Cryoablation of Tumors - Our small diameter to miniature finned tubes (hypodermic) can be found in cryostats and cryogenic coolers for military use, or in the medical profession for the cryoablation of tumors.